It's What The Cool Kids Are Driving! Musicians of the world, listen up! We are thrilled to announce the launch of our newest exciting cross-platform social media campaign for the Ford Fiesta and Western Region Ford Dealers – "Gimme the Gig" – which could make one unsigned musician or band the next big musical sensation. To make this huge opportunity happen, we are privileged to partner with Grammy-Award winning producer Don Was, and Tom Grill of the Western Region Ford Dealers. We, along with Grill, developed “Gimme the Gig,” a multimedia campaign integrating experiential, social, and digital interactions while building awareness around the 2011 Ford Fiesta. 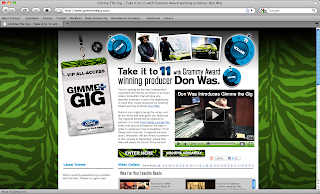 Unsigned musicians throughout the US are currently able to submit performance videos to the Gimme the Gig website, where fans can watch and vote on their favorite acts. Top-rated bands from all over the US will perform in the Ford Fiesta Lounge Tour taking place at lounges and venues across the Western Region (Desert States, Mountain States, Northwest States, Southern and Northern California). 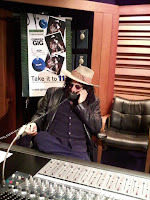 The schedule can be found on the Gimme the Gig website, where fans can enter the Groupie Giveaway for a chance to win one of several prizes each month for the life of the campaign. The winning musician or band will be selected at the Gimme the Gig finale at which seven finalists, including two “wild card” selections, will compete at a TBC venue in Los Angeles. Judges will include the dance crew Kaba Modern Legacy (finalists on MTVs America’s Best Dance Crew), pro skateboarder Sergie Ventura, pro surfer Erica Hosseini, and Don Was himself! All musical submissions must be received by November 30, 2010, so get your videos posted and don’t forget to vote at GimmetheGig.com!